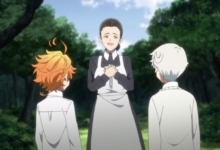 I had no foreknowledge or expectations when I started watching The Promised Neverland. The show seems heartwarming at first, opening on a peaceful orphanage filled with smiling children that get along and play outside together. They all rely on Isabella, a woman they lovingly call “Mama,” for guidance and love. However, strange elements stick out from the very beginning. Why is there only one adult taking care of dozens of children? Why do the kids have numbers tattooed on their necks as if they were prisoners? It doesn’t take long for the answer to be revealed, as the main protagonist Emma stumbles upon the fact that they aren’t living in an orphanage at all, but rather a farm that raises premium children whose brains are considered a delicacy by rich demons. It’s a shocking revelation, and one that, by the end of the series, it had made me reconsider my own views on farms and animals. 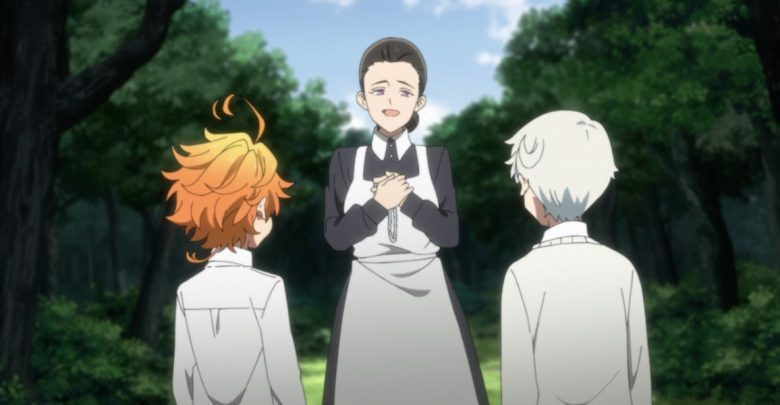 Throughout the season, The Promised Neverland reveals more information about its world. While children are essentially mass-produced for consumption, there are five premium farms that allow their children to live a more normal life. Due to their intense schooling and lack of trauma, they taste better than their caged counterparts. In a warped way, these kids are the lucky ones — a strange thing to say about those that are born solely so they can be devoured by a monster after their brain is fully developed. But when presented with the choice of living in a cage or being able to live semi-freely, the decision is easily made. However, the viewer knows that there is a third option available: the kids should be able to live freely and have an opportunity to become adults and realize their purpose in life. Despite never having read the manga the show is based upon, all of Isabella’s propaganda felt strangely familiar, because I had seen this exact messaging from free-range farms that produce eggs, poultry, and other animal products. The philosophy of free range farming is the same as the demons’ — that giving their product better treatment, nutrition and care will result in creating better food. The websites of self-described humane farms describe themselves similarly to how Isabella describes her world: one company says that they believe in “raising our hens to thrive under natural conditions,” and that “love makes the difference.” Similarly, another promises the “highest quality and humanely raised” animals. The end product might be different, but the similarities in how they are sold are striking. Despite being a vegetarian, I’ve never had an issue with free-range and organic farms. Beyond being offered as a premium product, they are always marketed as the morally right purchase. There is a sense of comfort in buying from them. Sure, there are plenty of other farms producing the same product in abhorrent conditions, but I felt like I was supporting people doing it the right way. However, The Promised Neverland has made me realize that there are issues with consuming any animal product. All farms imprison, breed, and use these animals for a specific purpose. It’s an unnatural living environment built upon putting the desires of humans above the lives of animals — something I don’t want to support anymore. 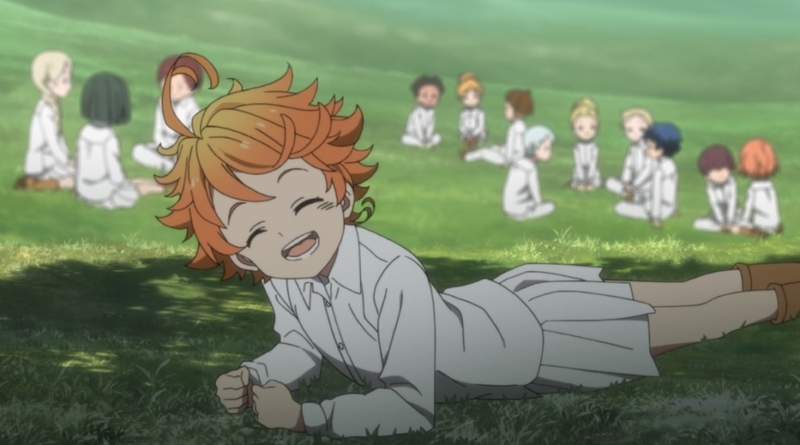 The Promised Neverland is able to make such a strong argument for going vegan and for people to reconsider how they support farms because it takes the situation to a visceral extreme. Nobody wants to see children suffer, and the farms seem so much more sinister when human life is at stake. In a way, everyone watching the show is a lot more like the demons than the protagonists. Humans are the ones that set up these farms to produce food for ourselves, prioritizing our desires over other species, and then patting ourselves on the back for being less cruel while still imprisoning them. Emma has many chances to reconsider her plan to escape and to give in to the system. Isabella even offers her a recommendation to become a mother of a farm, allowing her to escape slaughter. However, she stays true to her conviction and refuses to continue a cycle of deception and harm. She would rather lead a potentially terrible life outside of the farm than continue to be trapped in an idealized living environment that didn’t reflect the actual world. Since then, I don’t think I’ll ever see farms the same way.